Sounds fancy, eh? It’s not. Don’t be alarmed. On Sunday nights, I usually try to make a big pot of something that we can eat for dinner and that will last Ameir and I all week to take to work/school for lunch. This came together so quickly, I was back to lounging on the sofa in no time. (Summer break!). This thick sauce would also be good over couscous or stuffed into a hoagie roll with cheese melted on top. You don’t even need me to tell you want to do. This is so easy. But, for the sake of writing a blog post, I will. Come on, say it with me in your head. – Olive oil in a pan, sautee onions and garlic till soft. – Meanwhile, microwave green beans. Add to onions and garlic, hit it with salt and pepper. – Add in diced tomato. Shred chicken into pan. 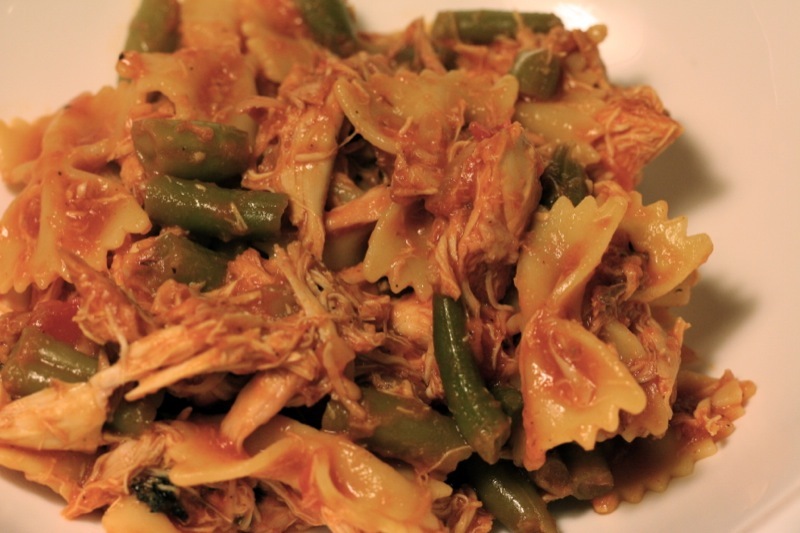 – Combine pasta with chicken and tomato sauce.